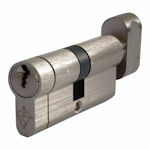 Euro Profile & Round Rim Cylinder Lock Barrels from our "Adapta Prime" high security cylinder range in "Keyed to Differ" format whereby cylinders are operable with their individual keys only. Available from stock in 6 high quality finishes to match perfectly with our door furniture ranges - Polished or Satin Brass, Polished Chrome, Satin Nickel, Antique Brass & Antique Dark Bronze. Euro Profile & Round Rim Cylinder Lock Barrels from our high security "Adapta Prime" cylinder range in "Keyed Alike" format whereby cylinders are supplied in passing groups all operated by the same key(s). This option is a popular choice for multiple door applications as it reduces the amount of different keys required. This feature is available for all of our Adapta Prime cylinders so you can have any combination of the cylinder lock barrel types, sizes & finishes within the range as part of your group. Euro Profile & Round Rim Cylinder Lock Barrels from our high security "Adapta Prime" cylinder range in "Master Keyed" format whereby cylinders are operable by their own, individual keys plus a Master Key that operates all other cylinders in the same system. This option is an excellent choice for multi door applications where access to individual doors needs to be controlled on a hierachical basis. This feature is available for all of our Adapta Prime cylinders so you can have any combination of the cylinder lock barrel types, sizes & finishes within the range as part of your master key system.